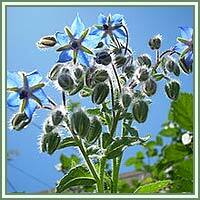 Habitat: Borage is native to Siria, and naturalized throughout Europe, Africa and South America. It grows on sandy soil. 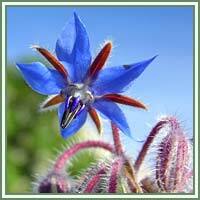 Description: Borage is an annual plant, grows to 100 cm high. Leaves are simple, oval and hairy, usually deep green in color. It has branched, round stems and star-shaped, bright blue flowers with cone-shaped, black anthers in center. Fruits are brownish-black nutlets. Useful components: Potassium, mineral acids. Medicinal use: Borage is a strong diuretic, demulcent and emollient. Externally, infusion obtained from the leaves is used as a polutice for inflammatory swellings. Internally, it has been widely used for fevers and pulmonary disorders. Flowers and leaves are helpful in easing the symptoms of bronchitis, and also in treatment of diarrhea.